According to Ether 3, the plates and interpreters were buried together. The interpreters and plates should therefore stay together. But according to the text, King Limhi has the plates while King Mosiah II has the interpreters (Mosiah 8:13). King Limhi and King Mosiah II live in different lands. This theory ignores Ether 3:23 which says that the the plates and interpreters were buried together. Another very serious discrepancy occurs as to this Urim and Thummim. In the Book of Mormon there are two mentioned. One, p. 522, is possessed by Jared’s brother, who seals them up with his plates, and hides them. These plates and interpreters, according to the Book of Mormon, have never been found. Ether, the last surviving descendant of Jared’s company, engraves a succinct history of his fore fathers on twenty-four golden plates and dies, p. 549. These plates of Ether are found by the people of Limhi, about 120 B. C., p. 161. With these plates was brought the breast-plate referred to, but with them neither the plates of Jared’s brother, nor his interpreters. They have not been found. Besides these, there is another pair of interpreters, possessed by one Mosiah, who declares he received them, they “having been handed down from generation to generation,” p. 204. 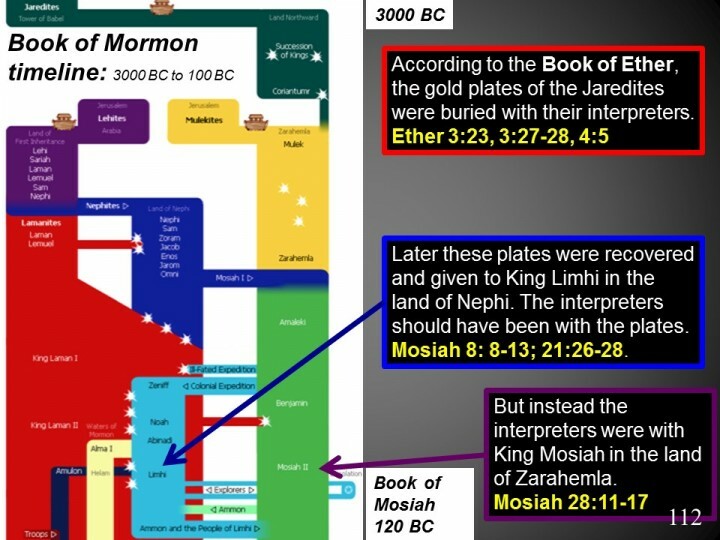 All that Mosiah knew about Jared was by means of Ether’s plates of gold which he interpreted by his two interpreters. The interpreters of Mosiah were handed down to Mormon.